Ships from US warehouse(fast delivery): The storage box is a new type of fiber product that is made of polyester and nonwoven fabric, soft and breathable. It can effectively prevent all kinds of aphids from invading. Suitable for home leisure life. Storage Expert: The daily use of small clothes is always a headache, the storage box can store accessories such as underwear, socks, ties, etc. Make your wardrobe clean and tidy, quickly find what you need, saving you precious time. 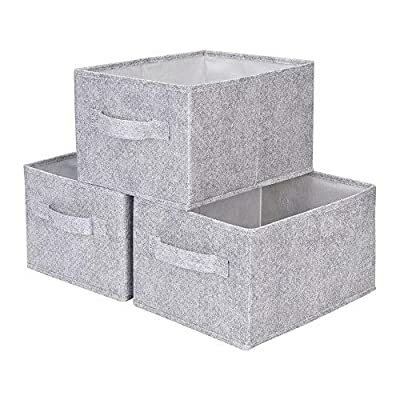 2 Handles Design: These nonwoven fabric storage boxes can be easily slided in and pulled out of cube shelves thanks to their sewn in handles, durable and easy to use. Besides, it is also easy to carry with these handles. COLLAPSIBLE DESIGN: The foldable feature of this closet storage bin means it is space-saving and convenient to take along. You could simply fold it up when you don’t use it or when you need it for travel use. 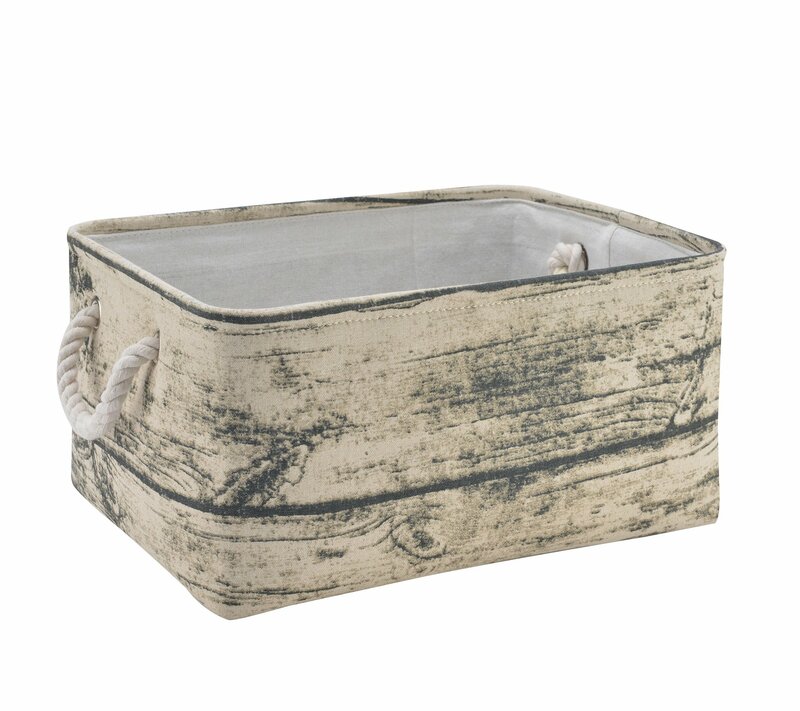 PREMIUM QUALITY: This fabric storage box made of thicken cardboard frame for reinforced structure. Polyester fabric sturdy but also soft, it will not scrape shelves, closets, beds etc. 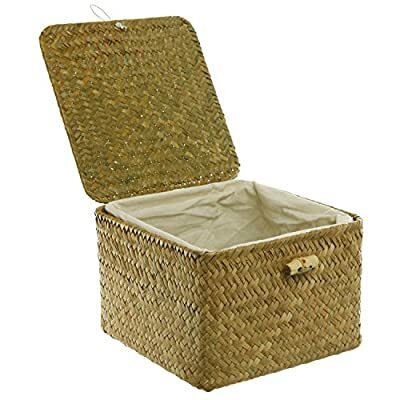 Material: 100% Made of natural seagrass & water hyacinth in a woven pattern over an iron frame. Good quality and well made by hands. 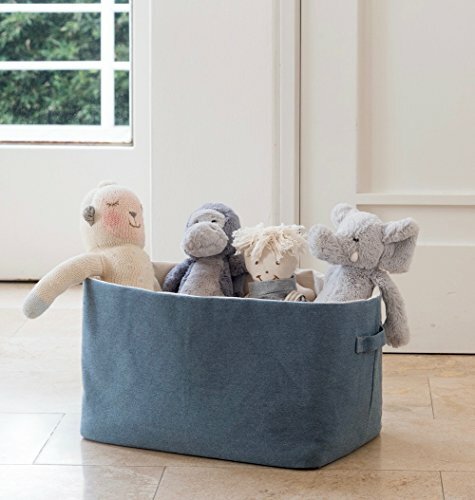 Basket with Linen Lining which is removable and washable. Nice looking and perfect for household storage. Design: Folding design, space saving, easy to fold and very convenient. Hollow handle design, ventilated, eco-friendly and breathable. 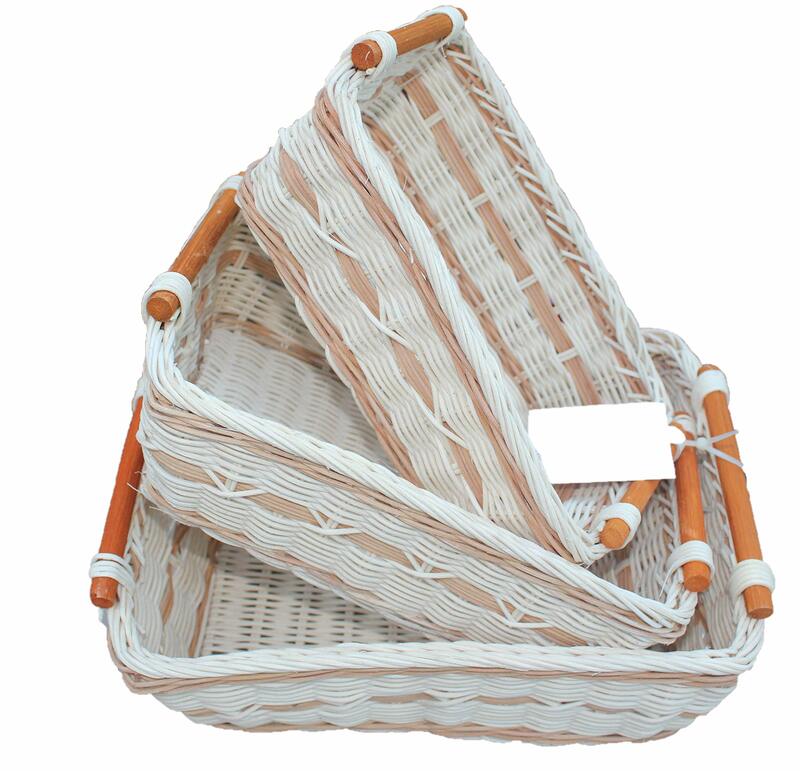 Material: 100% made of natural seagrass in a woven pattern over an iron frame.Good quality and well made by hands. Nice looking and perfect for household storage. ★Made of Natural Paper Rope.Environmental materials don’t harm you and your family. 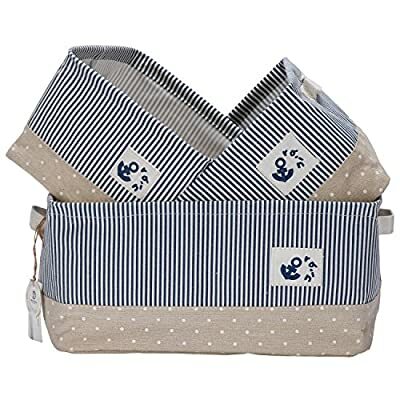 ★spacious storage space can hold more toys and clothes.It is easy to fold when you are not using .You will save a lot of space. ❤Well Standing and Sturdy Construction: Special folding methods, They can stand up straight even if nothing is put inside. 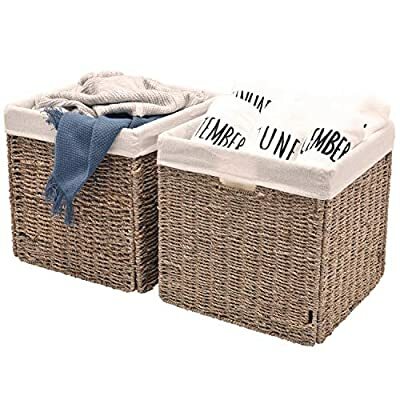 ❤Large Beige Storage Bin-16.1Lx12.2Wx7.9H(inch). Larger than most collapsible bins allowing you to move more and store more. ★Well Standing and Sturdy Construction: Special folding methods, They can stand up straight even if nothing is put inside. 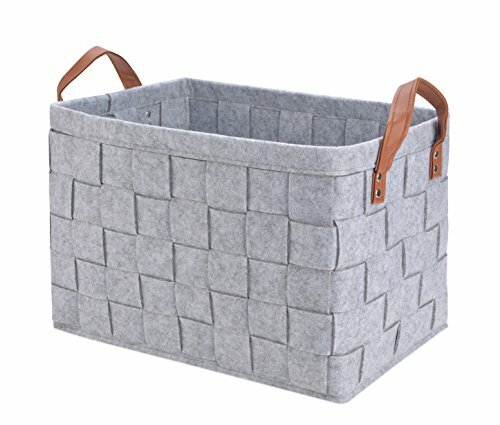 ★Large Grey Storage Bin-16Lx11.8Wx11.5H(inch), 19.1(oz). Larger than most collapsible bins allowing you to move more and store more. NO TOOLS OR HARDWARE NEEDED TO INSTALL – These child cabinet and drawer locks are incredibly easy to install, if you need to child proof your drawers and cupboards and don’t want to use a drill then you’ve found the best baby proofing solution! UNIVERSAL FIT BABYPROOFING – Supplied with catch and latch, virtually any cabinet can be made baby safe. And as no drill is needed, your furniture is left undamaged when it’s time to remove the baby proofing. DISCRETE AND NON INVASIVE DESIGN – Completely invisible when your cabinets are shut, but strong and secure enough to keep your children out of harm, you can child safe your kitchen with locks that can’t be seen when the doors are shut. Sold as a set of three. 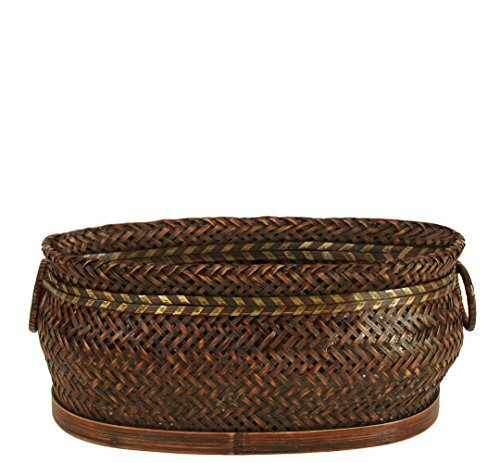 Handwoven eco-friendly wicker basket with durable rattan wicker material and each comes with a curve pole handle on each end of the basket. 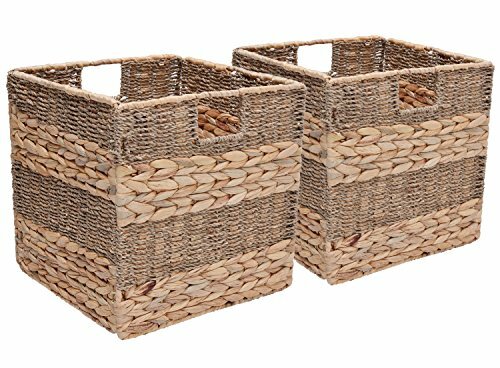 These wicker baskets are also stackable, making storage easy and convenient. 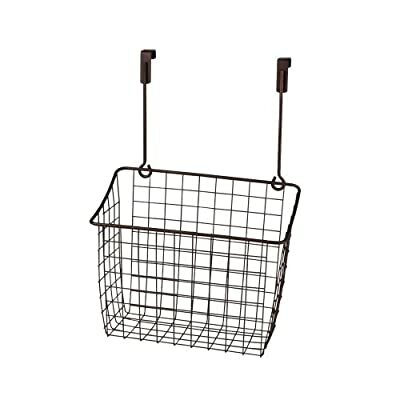 Make organizing any room in your home easy with this basket. 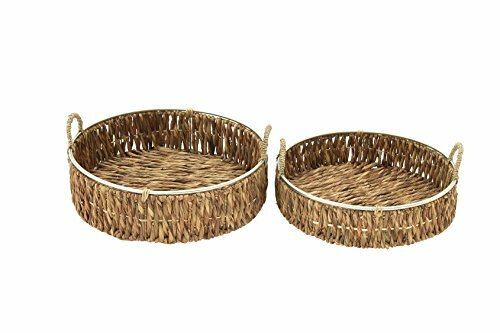 These Wicker baskets are handcrafted therefore they may vary slightly in sizes. 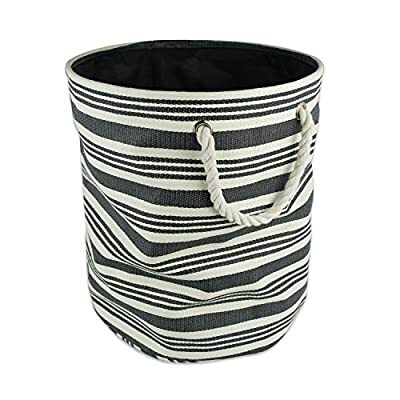 Defeat disorganization with this convenient storage hand woven basket with lining. Comes with a hinged top lid that can be latched shut using the attached elastic band. Perfect to keep loose items organized and looks chic on any shelving. 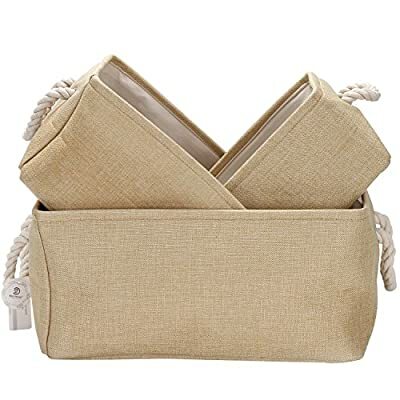 STURDY COTTON ROPE HANDLES: Soft braided handles knotted through strong metal grommets, allow for moving the cute fantastic storage box with 25 lbs heavy load, while keeping a perfect comfortable touch. Enjoy the fun of DIY and assemble the ropes yourself! Please refer to the picture for an easy assembling instruction. 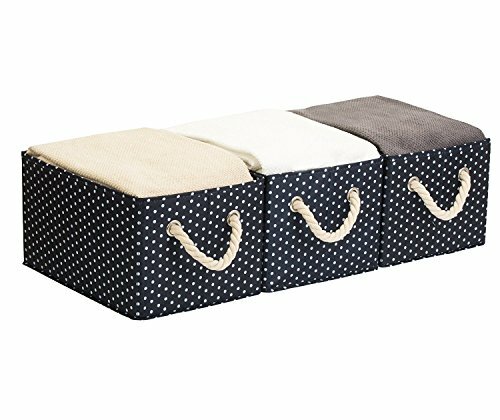 FRESH AND ELEGANT STYLE: Minimalist design with deep blue color and white dot style makes these unique fabric storage bins simple yet exquisite, perfectly fits in your room layout and household decors, leaving your space less cluttered. 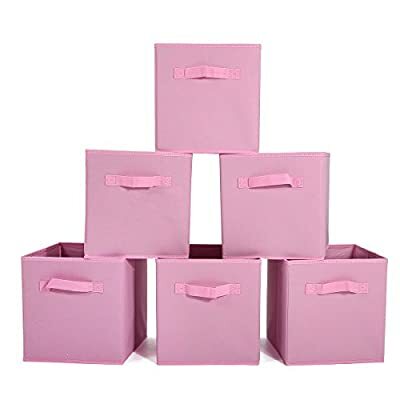 DURABLE MATERIALS: These decorative canvas storage bins are made of smell-free polyester fabric with thick and stiff cardboard inside, sturdy and durable for daily use. They can stand up straight even if nothing is put inside. The size is 14.4*10.0*8.3 inches (L*W*H), perfect on your desk. 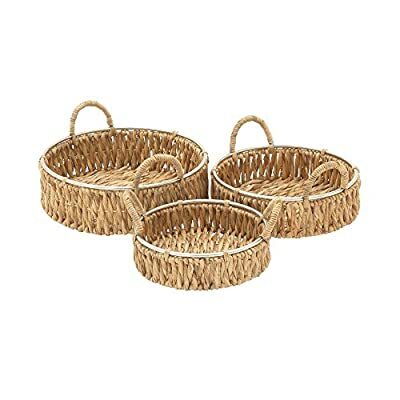 High quality, delicate handmade storage baskets, art & craft, set of 3. 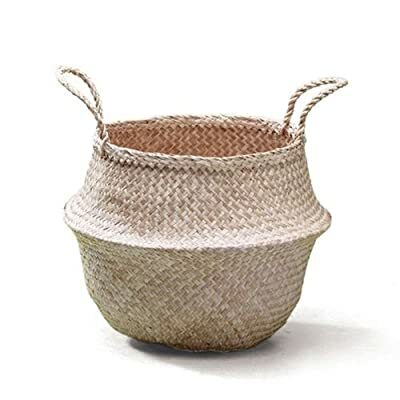 Stylish, eco-friendly, brown woven, made of corn wrapper ropes and water hyacinth with sturdy iron frame, removable cotton-linen liner. 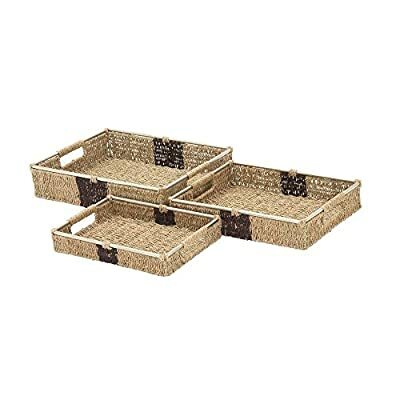 Multiple-use storage box, utility and suitable for your bedrooms, living room, closets, shelves or anywhere in the house. 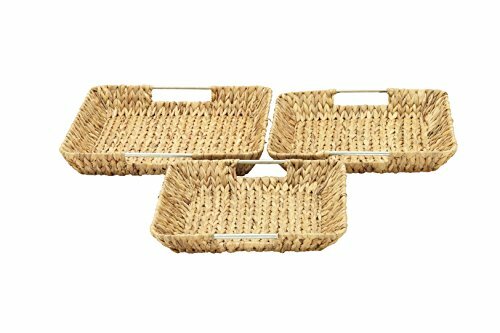 DESIGNER STORAGE BASKET. 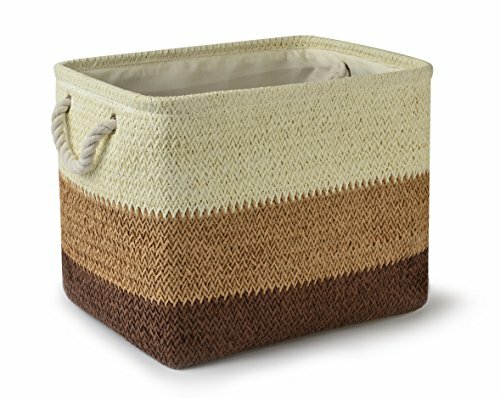 TOY STORAGE ORGANIZER BASKET. Carefully handcrafted to make any home look amazing. 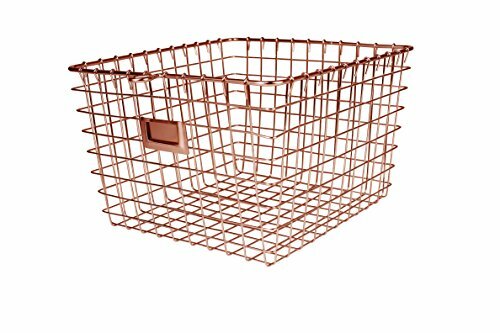 ECO STORAGE BASKET. Made with upcycled denim and cotton fabric, eliminating the use of dyes and chemicals, and saving thousands of liters of water! PREMIUM QUALITY fabric and craftmanship. 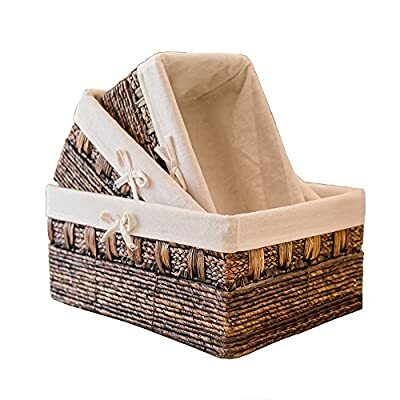 Great as a KIDS TOY STORAGE basket, PET TOY and BABY TOY storage oranizer basket.